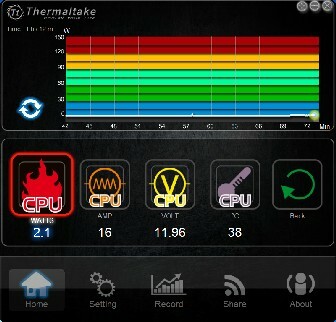 Las Vegas, USA – January 5, 2015－Thermaltake, an industry leader in computer chassis, thermal solutions, and power supply units, and Thermaltake is extending its lead over the competition with the DPS G App 2.0 software for Toughpower DPS G power supply units, the world’s first Internet of Things (IoT) power supply, providing IoT solution with hardware, PC software, mobile application, and Cloud management platform. In practical, Thermaltake is offering “Three Screens and a Cloud” service, users are capable of accessing data as well as doing PSU management on various PC and mobile devices, anytime, anywhere. An enhancement of the previous DPS App, DPS G App 2.0 enables users of systems with Toughpower DPS G PSUs to digitally monitor key parameters of the CPU and VGA, including voltage, current, wattage, and temperature. The DPS G App 2.0 is now available for Toughpower DPS G power (450W, 550W, 650W, 750W, 850W and 1050W with 80 Plus Gold certification). Users can download the software either on the Apple Store or Google Play starting March, 2015. 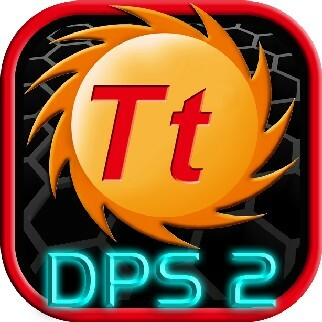 The PC version of DPS G App 2.0 and DPS is now available for download at the Thermaltake website. Once the data is synchronized on the Cloud Power Resource Management Platform, soon-to-be-available DPS G App2.0 mobile version and DPS G PSU Cloud Power Resource Management Platform will allow users of mobile devices to check and share system parameter data anytime anywhere. 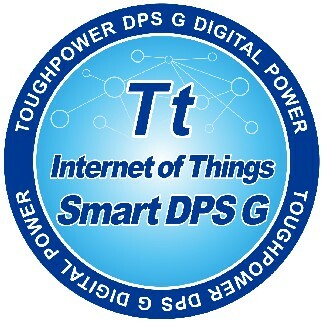 The combination of Toughpower DPS G and DPS G App 2.0 software creates an intelligent platform that helps users manage expenses, monitor and organize a quantitative database, and share data with friends via the cloud, to provide the perfect IoT power solution! 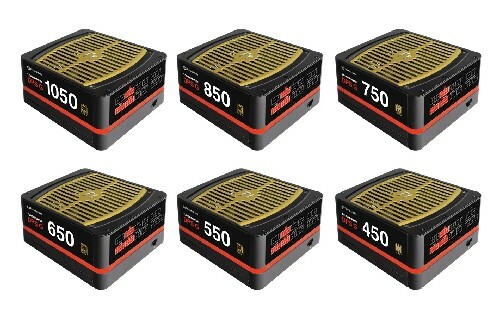 ● Hardware : Toughpower DPS G Power (450W, 550W, 650W, 750W, 850W and 1050W with 80 Plus Gold certification) ─ Available Now! 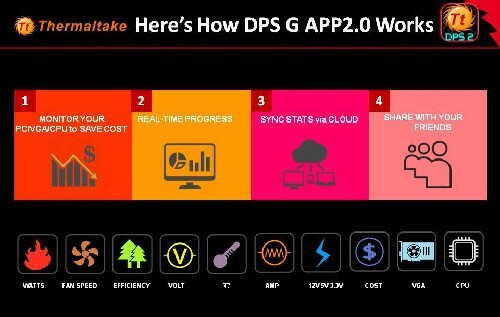 ● Software : DPS G App 2.0 PC Version ─ Available Now! ● Software : DPS G App 2.0 Mobile Version ─ Available to download via Apple Store and Google Play in March. ● Cloud platform: DPS G Cloud Power Resource Management Platform ─ Available in March. 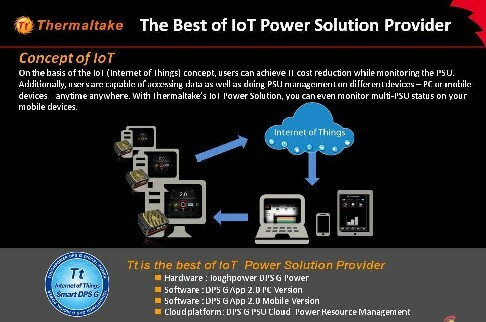 On the basis of the IoT (Internet of Things) concept, users can achieve IT cost reduction while monitoring the PSU. Additionally, users are capable of accessing data as well as doing PSU management on different devices – PC or mobile devices – anytime anywhere. The smart software digitally calculates the electricity cost. This can be helpful in expense control/analysis and as a management tool for personal businesses or SMBs. The DPS G App 2.0 enables users to monitor CPU and VGA parameters even when the system is being used. There is no need to close applications, web browser, and other software. Users can organize and save the record of personal usage pattern in detail for future review or analysis; each saved record can record up to six hours of usage. Plus there is no limit on the number of PSUs being monitored at any one time. DPS G App 2.0 provides users a convenient way to share power usage results with friends and colleagues through social network applications such as Facebook, Twitter, and Weibo, or via e-mail. 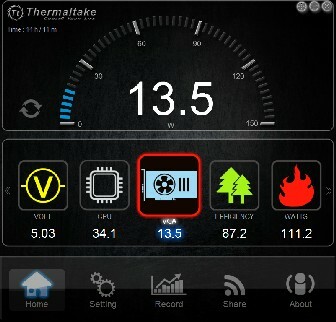 The DPS G App 2.0 software allows users to monitor and adjust the fan speed of the system’s power supply in either silent or performance mode.